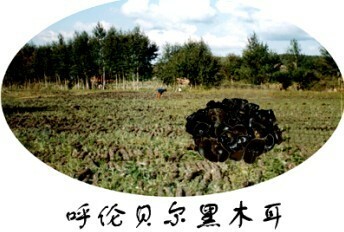 Hulun Buir (Hulunbeir) Grassland (hū lún bèi ěr dà cǎo yuán 呼伦贝尔大草原) is located in Hailaer (hǎi lā ěr 海拉尔) in the northeast of Inner Mongolia. 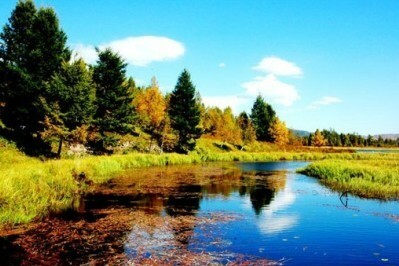 It is one of the six most beautiful grasslands in China. 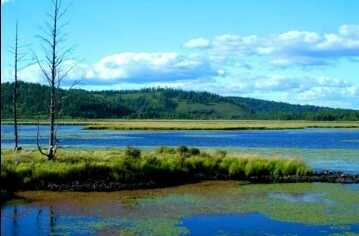 The Hulun Buir Grassland also enjoys the reputation of the “Most unsullied Grassland” because of the lack of pollution in this area. 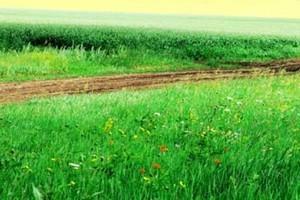 Situated near Hulun Buir City, this land is one of the world's three top grasslands. 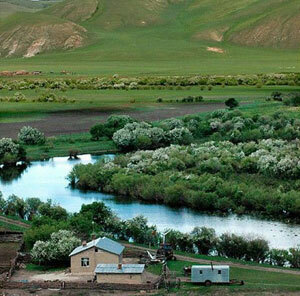 The plain was named after the handsome Hulun and beautiful Buir, two young Mongolian lovers in a legend. The young lovers are separated and become the lakes Hulun and Buir. The area is the home of many minority ethnic groups, and it is an important place for the festive occasions of the nomadic groups in north China. 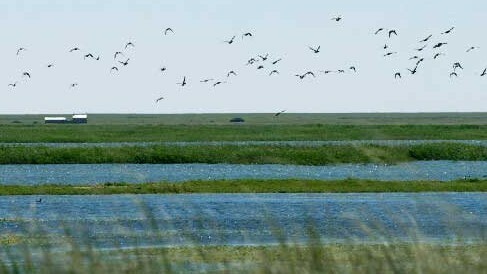 The Hulun Buir Grassland is known as the Kingdom of Pastureland and has more than 1,000 species of plants. On the grassland are green grass, beautiful flowers, zigzag rivers, crystal-clear lakes, sheep and cows, and herdsmen's yurts sending forth the fragrance of wine and of tea with milk. In spring, thousands of white swans hover in the sky here; in summer, flocks of cranes, egrets and storks gather; and in autumn wild geese fly over in tight formations to their havens in the south. Summer is the most spectaculars season on the grassland. Green waves of grass wave in the wind, larks sing by the waters, and blue butterflies dance on the petals of the flowers, form a peaceful and harmonious scene in which horses and sheep graze serenely. However, the legends about the prairie are alive in the memories of local people. Hulun Buir, the cradle of the Mongols, was also a realm of the Xianbei people (xiān bēi rén 鲜卑人) in the 4th -6th centuries. Ancient spearheads and the ruins of the fief of one brother of Genghis Khan (chéng jí sī hán 成吉思汗), who founded the Yuan Dynasty (yuán cháo 元朝) in the 13th century, all tell stories of war. The traditional ceremony of building Aobao (áo bāo 敖包) and the Nadam fair held in Xin Barag Left Banner (xīn bā ěr hǔ zuǒ qí 新巴尔虎左旗) and Xin Barag Right Banner (xīn bā ěr hǔ yòu qí 新巴尔虎右旗), and the summer carnival and winter Nadam fair held in the Ewenki (è wēn kè 鄂温克) Autonomous Banner are all grand events on the grassland. Wrestling matches, sled, horse and camel races, and dairy and lamb delicacies will feast both the eyes and stomachs of everybody. Hulun Buir Grassland is the most beautiful landscape of all the Inner Mongolia Grassland, possessing a meadow of more than 100,000,000 acres and a forest of over 200,000,000 acres, upwards of 500 lakes and some 3,000 rivers. The vast stretch of prairie seems to be a vast green blanket woven by Mother Nature as far as the eye can see. Stepping on it, the feeling of the soft and bouncy quality is breath-taking. Its title is well-deserved as one of the most beautiful, largest and unpolluted grasslands in the world. Here is China’s best-preserved grassland, home to over 120 enriched pastures, with grasses such as Elymus, Stipa and Chiendent. The total number of plants species is no less than 1300, forming different features of the vegetation scenery. Whenever midsummer approaches, the grassland is full of flowers perfume and birds singing, complete with the pure and fresh air. Smoke rises continuously from the scattered Mongolian Yurts and when a gentle breeze stirs the grass, the cattle and sheep sing with joy. And you can enjoy a day-tour on horseback or "camelback", take “leileiche” (lei lei chē 勒勒车), go fishing close to the lake or hunt in the forests to enjoy the scenery of the grasslands. This fertile land is adorned with hundreds of silver chains and numerous pearls. The rivers and lakes originating from the Great Khingan (dà xīng ān 大兴安) Mountain that ranges across eastern Inner Mongolia and Heilongjiang (hēi lóng jiāng 黑龙江) Province. Rivers in Hulun Buir share one feature. They all dash down the mountains when they get to the flat terrain; they become mild and take their time meandering through the meadows. The Mergel Gol River is said to have ''the most bends on earth'', but the Yimin River (yī mǐn hé 伊敏河), which runs from Ewenki Banner into the city of Hailar, has even more bends. Yimin River forms a pattern of tortuous ribbons. 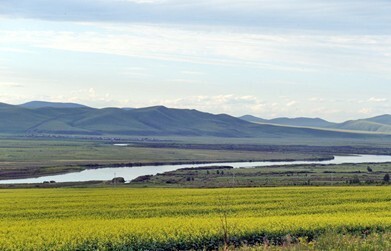 The flat terrain enables the rivers to linger on as long as they wish, nurturing the land on both banks and supporting the numerous flocks and herds of Hulun Buir. The Hulun Nur (Nur means lake in Monglian) (hū lún hú 呼伦湖), on the Orxon Gol River, is the fifth largest freshwater lake in China. 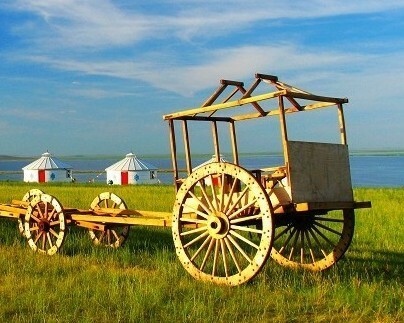 Covering 2,339 sq kilometers, the lake is also referred to by the Mongols as a ''Dalai'' (sea). Also on the Orxon Gol River but upstream in the south is Buir Nur (bèi ěr hú 贝尔湖), the boundary lake between China and Mongolia. When spring comes, shoals of fish in the Buir Nur will swim downstream along the Orxon Gol River to lay their eggs in the Hulun Nur. Between the two lakes is the Dalai Lake Nature Reserve. The Ergun River (é ěr gǔ nà hé 额尔古纳河) in Chen Barag Banner (chén bā ěr hǔ qí 陈巴尔虎旗) flows north, forming part of the boundary between China and Russia. On the way, the 700-kilometer-long watercourse is joined by other smaller ones flowing across the Hulun Buir Grassland, and plunges through deep valleys and past precipitous cliffs in the Great Khingan Mountains, before joining the Heilong River and emptying into the sea. Rich water resources have brought vitality and vigor to Hunlun Buir, and more than 600 kinds of high grassland plants, make it one of the richest grasslands in the world. 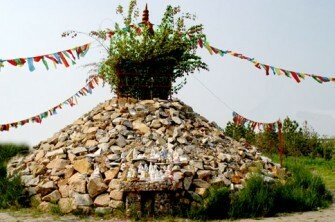 Long known as the "Pearl of the Grasslands", Hailar acts as a gateway between China and Russia. The district has an estimated population of 256,000, and serves as a regional centre for commerce, trade, and transportation. Hailar was founded as a Chinese fort in 1734. It is now a centre of agricultural production on the Chinese Eastern RR. Hailar has no less than 4 shopping malls - Friendship, Yishidan, Huahui and Busen- which are similar to Western ones in their scope and variety, if not quite as good. It is the China’s busiest land port of entry and shares a border 54km to north with Russia. It has an area of 696.3 square kilometers and a population of more than 300,000 (in 2010). 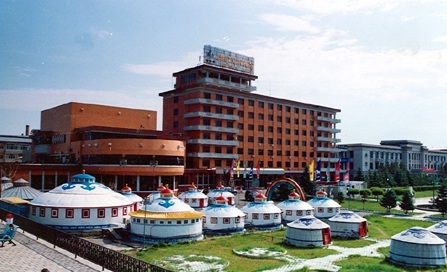 Manzhouli is located in the western part of the Hulunbuir prefecture-level city. Lake Hulun to its immediate south is the China's fifth largest freshwater lake with an area of 2,600 square km and an average depth of just 5 meters. Ershan city lies at the foot of the middle reaches of Great Khingan Range and borders the Hulun Buir Grassland to the east. With mineral springs dotting the blue-green Ershan Mountain of the city, the pastoral vistas of Ershan draw large numbers of tourists who come to escape from the hustle and bustle of metropolis life. The Ershan Mountain is rich in diversified landforms, especially volcanoes and hot springs. The winding Halaha River (hā lā hā hé 哈拉哈河) flows through the grassland of Ershan Mountain. Ershan is home to just 10,000 people. In reality it feels more like 100 people and it comes as a shock that the streets are quiet: unwalked by feet and undriven by traffic. The jumble of buildings that line the main street are a strange architectural mishmash with turrets, towers and grand balconies in enough pastel shades to rival the wild flower-covered hills surrounding them. Behind the main street are a row of the more familiar mini high-rise apartments and also the humble single-storied dwellings usually home to farmers, but here filled with woodcutters and bicycle repairers. Aershan comes alive in the winter as a skiing and hot spring resort; although the only evidence of this lay in the occasional run-down chair lifts that strode up the mountain. White Melon-seeds, Black Agaric, Milk Tea (nǎi chá 奶茶), Baked Gigot (kǎo yáng tǔi 烤羊腿), Hand-tore Mutton, Roasted Whole-lamb (kǎo qúan yáng 烤全羊), Banquet for All Fish (qúan yú yàn 全鱼宴), etc. 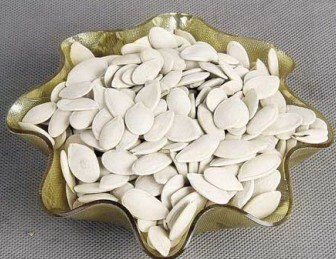 White Melon-seed and Black Agaric are two native products mainly in Inner Mongolia. Black Agaric has a long history. This species is separated and tamed from wild fungi. 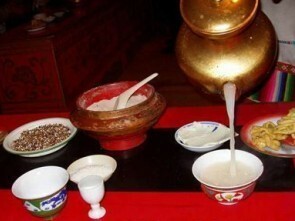 It is also one of the specialties of InnerMongolia. Hand-tore Mutton, as the name suggests, means that the mutton is taken by hand directly. It had been the essential food for the Herdsman to serve guests It will be a deeply pity if you don’t taste the Handlebar Mutton in you grassland tour. Divided the mutton into several pieces according to the articulations, then boil in the soup, when the mutton changes color, it could be taken. Roasted Whole-lamb is the traditional Mongolian food, which is specially prepared when a dinner party is held in honor of the distinguished guests or a great celebration is held. The Roasted Whole-lamb, which looks golden red and tastes quite delicious, is laid on a square wooden dish. 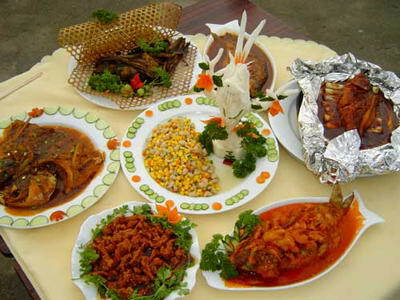 The carp, crucian, white fish and red-tail fish raised in Hulun Lake of Inner Mongolia are fresh and highly nutritious. The fresh fish and shrimps raised in the lake can be made into more than 120 dishes-an all-fish banquet. Fish dishes are not only nutritious, but also tasty and delicious. The all-fish banquet can have 12, 14, 20, 24, or even more than 100 dishes. The main rare dishes includes Twin Dragons Playing with Pearl (èr lóng xì zhū 二龙戏珠), Home-made Coiled Crucian (jiā cháng áo jí yú 家常熬鲫鱼), Club-shaped Carp (méi huā lǐ yú 梅花鲤鱼), Oil-dipped Carp (yóu jìn lǐ yú 油浸鲤鱼), Carp with Spawn (lǐ yú shuǎi zǐ 鲤鱼甩子), Squirrel Carp (sōng shǔlǐ yú 松鼠鲤鱼), etc. Beijing—Hailar City—Beijing: five flights daily in high season. Generally No flight after the end of October. There are ONLY 2 trains to run daily from Beijing to Hailar City. There are 16 trains to run daily passing by Beijing to Huhhot City. In Hailar City taking by bus to East Hulun Buir Grassland is about RMB 11 lasting about 1 hour BUT the wise way is hair a private car. At end of spring, there is snowstorm, so get to know the weather before going. Please take enough water, sunbonnet, sunglass, and suntan oil in summer. Bring warm clothes with you because weather is change to cold at night.